When decorating your home, don’t forget to pay attention to the spaces that connect each room together, namely the hall, stairs and landing. 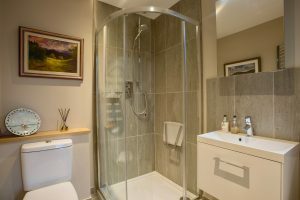 Choose paints, wallpaper, flooring and lighting that will complement the adjoining areas and will provide a seamless path between the two. Make sure there is some harmony between the levels of light between each area so that your eyes can adjust naturally when passing from room to room. The hallway is the entrance to your home and offers the first glimpse of your style and personality. 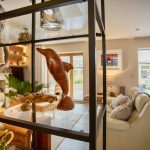 As it is a walk-through area you can afford to have some fun with the décor. Hallways often don’t have an abundance of natural light, so add some colour and warmth with patterned wallpaper or a feature wall. If you want to play it safe with a neutral colour palette, make a statement with a bright rug. Decorate the hall, stairs and landing in the same tone as the adjoining rooms and simply change the floor covering in each room to differentiate. Add family photos to the walls to bring your home to life and, if space allows, a small table. Lighting for the hallway needs to be inviting. 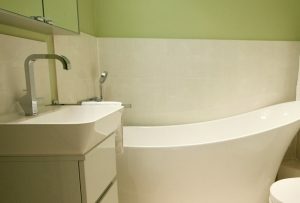 Consider the dimensions of the area before choosing your fitting. For a long narrow space try recessed down lights to guide you down the hallway. If your ceiling height is low a flush ceiling fitting or semi flush will work well and won’t cause an obstruction. For high ceilings make a dramatic statement with a stunning chandelier. If you have a table, consider a smart table lamp to create the perfect cosy ambience. Use mirrors to bounce the light around the hall and create a feeling of space. 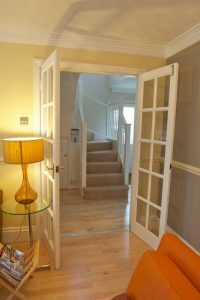 Your landing may be less visible than your hallway but still deserves to be beautifully decorated. 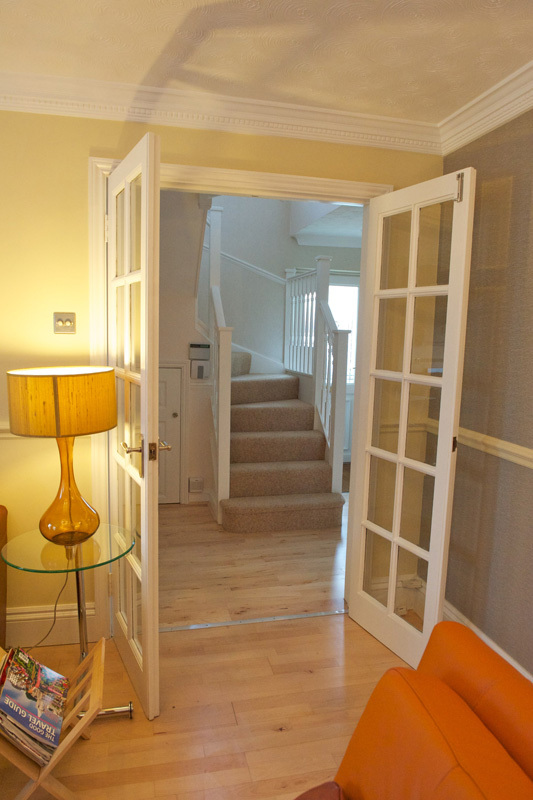 As with the hallway, you need to take into consideration the dimensions and whether the space lends itself to a bright and bold makeover or a more subtle approach. Again recessed lights will work well. If you have younger children you may want to consider choosing lights that can be fully dimmed at nighttime. Floor washers can look effective when used on a landing and will add interest when illuminating the area. 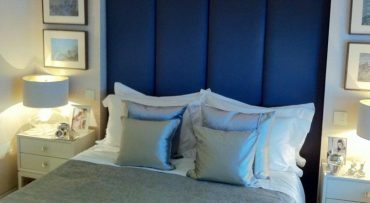 Wall lights can add softness to the upstairs décor and can be used in the adjoining bedrooms for a unified look. Linking upstairs with downstairs, the stairway needs to tie in with both the hall and landing décor. Choose paints in the same hue or in complementing colours and consider stair runners for a stylish effect. There is probably not a lot of natural light in this area so choose your stair lighting wisely. Dimmable stair lights allow full illumination for walking up and down safely and a more subtle background light when not in use. 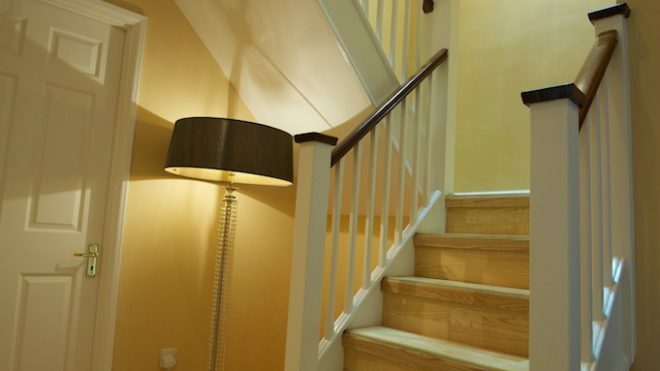 Wall lights can make a stylish statement as can a cascading pendant at the top of the stairs. Recessed stair lights set into the steps themselves or lined along the wall next to the stairs can give a modern and seamless finish and a warm wash of light.